There was, we're told, a golden age of travelling. A time before jet airliners compressed the planet to the point that anywhere on the globe could be reached in a single day, and before the highways and byways of these islands were so clogged up that often driving a few hundred miles is more than a single day's work. Travelling then was full of romance, adventure and the promise of experiencing sights and sounds to which our souls had never before been directly exposed. These days, of course, travelling anywhere further than the corner shop is an exercise in remaining calm and retaining patience in the most trying of circumstances. Just getting from A to B can seem like it involves more obstacles than your average military assault course. And on particularly bad days, especially if you commute in a major city, it can seem like it presents more hurdles to overcome than an entire series of Total Wipeout. The key to survival, as anyone who has ever served in the military will tell you, is preparation. Plan the journey, prepare a contingency, arm yourself with as much data as you can, and, whatever else you do, for goodness sake make sure you've got plenty to keep the kids entertained. Happily, all of this can be achieved on an iPhone or iPad, with the addition of a small army of apps and a few choice accessories. 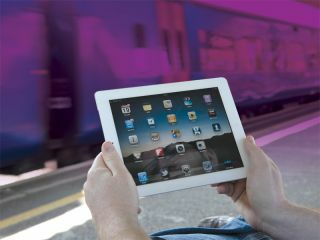 There are apps for planning your journey, whether you are travelling by air, road or train. There are some for keeping you updated with live data so you can respond and alter your plans if you need to. We'll point you in the direction of all the best ones over the next few pages. We'll also tell you how to make sure you and your companions are suitably entertained, both on the road and once your arrive at your destination. Most of the journeys completed every day are commutes to and from work. And let's face it, they're dreary. We can't ensure you'll get a seat on the train, or guarantee your bus will turn up on time, but we can help with making your journey much more entertaining, no matter how many delays there are. We'll have a special focus on apps to help you if you have to drag yourself several miles to work and back. Whether you like to catch-up on last night's TV, read a book, listen to a podcast or play a game, we've tossed aside the chaff and shown you where to find the wheat. There are several things you need to do in advance of leaving for your trip, of course, from choosing a case to protect your iPhone or iPad while you travel, to making sure you have enough battery power to last the journey. And there's no need to succumb to getting stuck indoors with nothing to do when you arrive. By the time you've read this, you'll know exactly how to turn your latest destination from a strange place where danger lurks around every corner to somewhere as familiar and friendly as your own back garden - although hopefully with a bit more to do. And what guide to keeping yourself busy while travelling would be complete without a games selection? There are few better ways to make a long journey just fly by than gaming on the go, and iOS is the perfect platform on which to do it. We've rounded up 20 great games for you to play, either on your own or with a partner. Travelling, of course, presents challenges when it comes to playing games that need precise, subtle movements, so we've avoided those in favour of games that can be enjoyed whether your in the quiet of a hotel room or sitting on a bus running on pot-hole infested roads. To start with, here are our top 10 iOS apps for frequent travellers. The iOS camera app is fine - and convenient now that you can access it from the lock screen - but Camera+ has so much to offer (including a software image stabiliser and 6× zoom), that if you plan to take pictures while you're away, we'd say it was essential. Snap images, fix them up, add an effect or two and share them online. Think of Evernote as a shoebox for all those scraps of information for which you can't find a home. Use it to store a PDF of your itinerary, confirmation of your flight bookings or details of the hotel where you've made reservations. Best of all, Evernote syncs with the desktop Mac and PC app and between iOS devices. Save the info once, access it from anywhere. If you're not a shoebox kind of person and prefer to be more organised, use TripIt to store all the essential information relating to your journey. Forward flight confirmations to a special email address and they'll be imported. The app will then build your itinerary automatically and enable you to share it with Calendar, or on social media sites such as Facebook. AV Player allows you to play video encoded in almost any format on your iPad, unlike the limited default Videos app. There's also a version for iPhone and iPod touch. Videos can be transferred either through iTunes or by using AVPlayer's Wi-Fi transfer. They're stored in the app's Media Explorer for when you want them. Urban Spoon helps you find something great to eat nearby. Check out your destination in advance with the power of Google Earth. Trip Advisor lets you find out what others think of places. Hail a cab in London from your iPhone with the help of Hailo. Find the cheapest fuel prices near you with Fuel Smart UK. Find a place to stay for a skiing holiday with the help of Ski Pad.